1080p Full HD displays not working out for you? 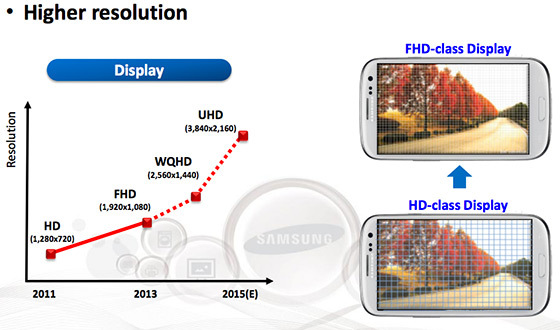 Well, fret not, as come 2014, Samsung will be launching devices with AMOLED displays that have a pixel density of 560ppi and a resolution of 2560 x 1440 – which means your standard 5-inch+ smartphone displays will be even sharper than they are now. Furthermore, you’ll have around a year to tout these high-resolution displays, as in 2015 Samsung will begin making 4k Ultra HD displays, of resolutions up till 3840 x 2160. Crazy times, right? The news came from Samsung’s Analyst Day event in Korea, and the company also confirmed that it is working on a custom ARM-compatible processor. Manufacturers like Qualcomm and Apple already do this, creating custom architectures from the ground up but keeping their processors compatible with the ARM instruction set, and now Samsung is looking to do the same. The processor will support 64-bit, but it looks like Samsung will continue to use Qualcomm’s 64-bit chips for LTE-enabled devices, which means you’ll still see two different variants of the company’s flagships. Flexible and folding displays, ultra-high-resolution displays, 64-bit custom processors: looks like the next couple of years are going to be pretty exciting for Samsung. I think it will be called Note 5 as next year, the Note 4 will probably be equipped with a 2K display. is samsung also working on some kind of long lasting battery? for example at least 3 days heavy usage, 5 days moderate usage? 4K TV screens are a must nowadays but on your mobile it’s an exaggeration. All other tech innovations are welcomed. Why would anyone need more than 1080p? This is crazy and must stop at FHD. Focuse on batteries from now on please! Consumer battery tech hasn’t evolved in the last decade and it won’t likely stop bottlenecking smartphones anytime sooner. It’s not up to Samsung to reinvent the battery. wouldn’t it be cool if it did! I’m actually really excited about this because we need this tech for the Oculus Rift which sits an inch or two from your face. When it’s *that* close, it *does* matter. This resolution thing is crazy, custom CPU is good thing as Qualcomm and Apple SoC’s are much efficient than ARM. You do realize that ARM doesn’t make any SoC and that Qualcomm and others just license ARM’s designs? In fact even the Krait 400 core is a modified A-15 so the efficiency statement is bogus. The resolution is crazy. How close do you need to hold the screen to see the difference between 1080p (2K) and 4K? Probably closer that you can even focus. Dude, 1080p is not 2K. It is pretty much 1K. 4K resolution has pixels four times more than 1080p. Dude, think about that for a second. 4K refers to 3840×2160, which is just under 4K in width. 1080p = 1920×1080, which is even closer to 2K than 3840 is to 4K. That said, yes, 4K has 4 times the pixels, but not because it’s 4x wider but because its 2x wide and 2x tall.